This article has been taken from IABM Journal Issue 108. To read the full Journal, click here. The company reviewed the market, looking at both traditional playout infrastructures and software-defined, IP-connected systems. Given that the facility would be built as part of its tenancy of the Arqiva control centre in Chalfont St Peter, west of London, a compact solution would have distinct advantages. Having reviewed the available options, Canis selected a proposal from UK Systems integrator Trams Ltd, which utilised Cinegy Technology. “We required a bespoke, cost-effective playout solution which would be designed and installed, then supported on a continuing basis,” said David Wright, managing director of Canis Television & Media. The requirement was to enable Canis to deliver four channels (SD or HD), with inputs and outputs over IP and SDI. To provide continuity, the playout servers needed to be duplicated for redundancy. Trams configured the installation with two Cinegy Air PRO playout servers. Under normal circumstances, each server handles two channels, but should there be a hardware failure, one Cinegy device can take over all four channels. The Cinegy software provides full playout functionality and is hosted on a pair of HPE DL360 1U servers. The commodity HPE hardware is augmented with NVIDIA Quadro M2000 graphics and Deltacast SDI interfaces. The NVIDIA Quadro cards allow GPU-accelerated encoding for the H.264 outputs, another important boost to efficiency and cost control. The installation also includes switching for SDI (Blackmagic Design) and ethernet (HP). 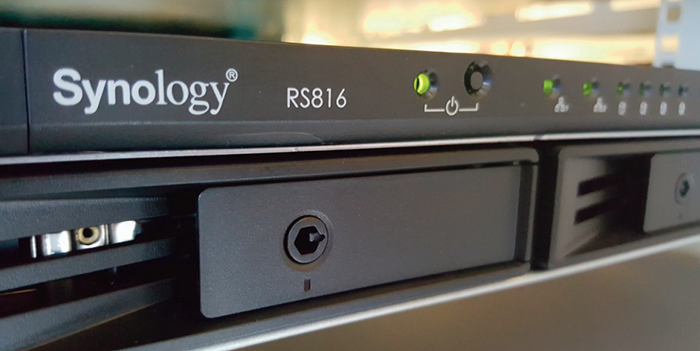 Shared content storage is on a Synology RS816 NAS, providing capacity for 12TB. The rack also includes a firewall from Sonicwall to protect the installation from online threats, and a long-term compliance recorder to meet the legal requirement to review the past six months of broadcasting on each channel. Along with power management, the whole installation fits in 21U of rack space inside the existing machine room at Arqiva. 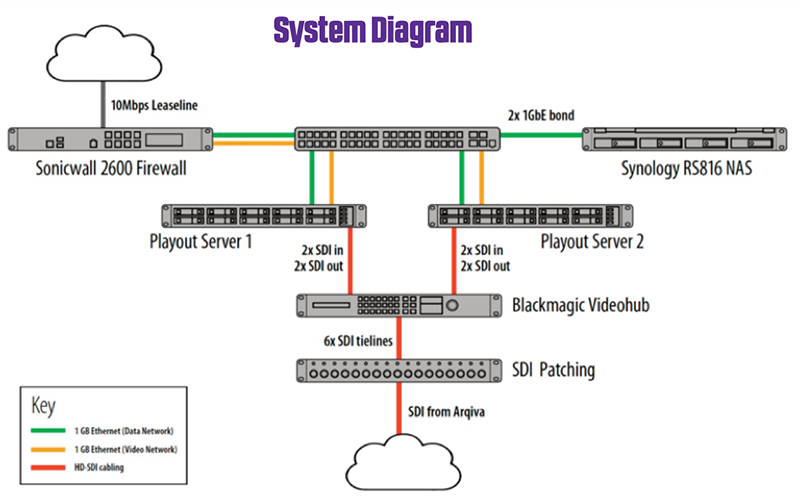 It is designed to be scalable with growth in the playout business at Canis. It is also designed to be compatible with future demands, such as 4K Ultra HD transmission. The result is a powerful and resilient playout infrastructure that meets the expectations of Canis’s clients and has been achieved in a compact and cost-effective form. It can accept content and deliver channels online, with strong firewall protection, and it retains SDI capabilities to allow local ingest and connectivity to existing multiplexing.